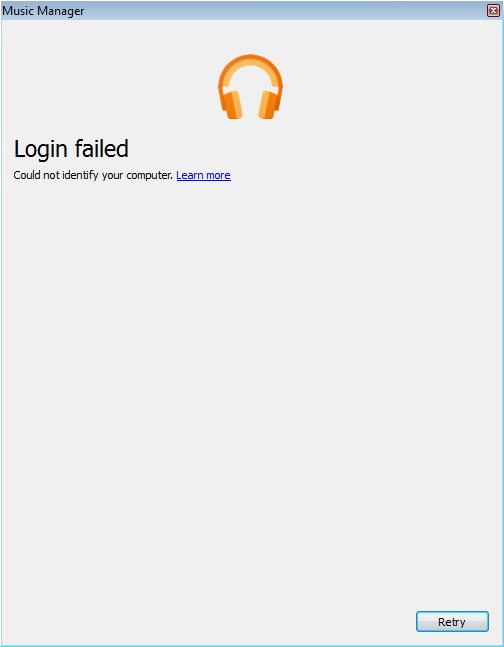 The first time you install Google Play Music Manager on a virtual machine you will probably receive the error, “Login failed. Could not identify your computer.” You’ll definitely experience this on any VMware ESXi virtual machines. Google currently doesn’t support virtual machines. Therefore, Music Manager on a virtual machine in Hyper-V or XenServer will likely encounter this problem as well. Installing Google Play Music Manager on a virtual machine is a great idea if you have a home server for streaming and storing media. Google Play Music is still one of the best free options for keeping a copy of your library in the cloud. But you will need to install Google Play’s Music Manager software if you want to automatically keep songs in sync (up to 50,000 songs). Just be aware that it is a great cloud option for streaming, but not archiving or backup, particularly if you are an audiophile. Google’s system will convert loseless FLAC and ALAC down to 320kbps MP3 files. The standard VMware OUI MAC addresses will NOT work, i.e., the following three-byte prefixes will not work: 00:0C:29 and 00:50:56. We have had no issues using a randomly generated MAC address. There is the small chance that it will overlap with another device on your network, but that is very unlikely, and you can easily use another MAC from the generated list. This entry was posted in ESXi, VMware and tagged Google, Google Play, networking, virtual machine, virtualization. Bookmark the permalink.